Even though we had stayed at some onsen towns during our first trip to Japan, we had never tried taken a bath in the hot springs. Our kids were very young and we felt the water would be too hot for them. But I must confess that the real reason was probably the thought of being completely naked in the company of complete strangers. Natural hot springs (onsen) are numerous and highly popular across Japan. Every region of the country has its share of hot springs and resort towns. 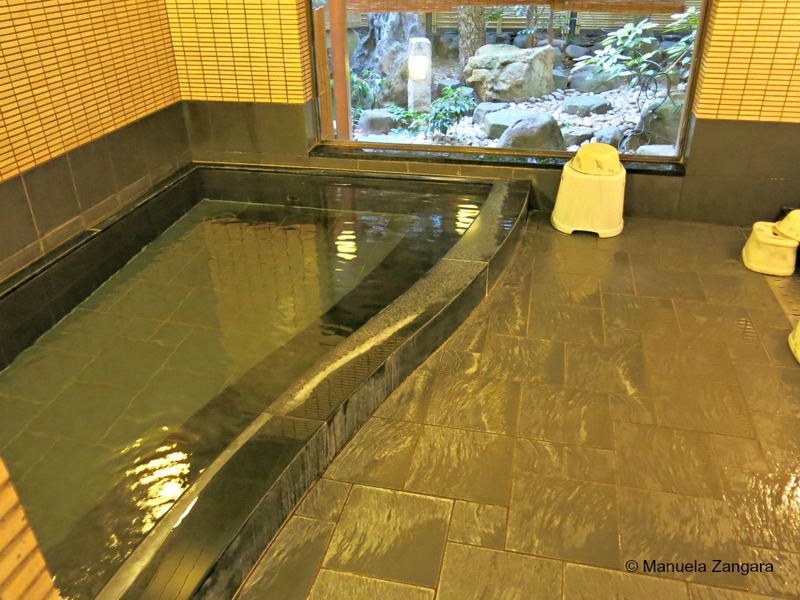 There are many types of onsen, distinguished by the minerals dissolved in the water. Different minerals provide different health benefits, and all hot springs are supposed to have a relaxing effect on your body and mind. The baths come in many varieties, indoors and outdoors, gender separated and mixed. Many onsens belong to a ryokan, but there are also public bath houses. I highly recommend an overnight stay at a ryokan with an onsen if you visit Japan where besides trying out the hot baths, you can also enjoy an amazing kaiseki dinner. In some cases, you will be able to book a small private bath (a family bath) to bathe alone or with your family, but the best hot springs, the biggest and most beautiful ones, are always shared. While some baths are wooden or stone tubs, others are built to resemble or are actually natural hot spring pools. Some outdoor baths are spectacularly situated in the mountains, valleys or along rivers, lake or sea shores. We particularly enjoyed the outdoor onsen of Shuhokaku Kogetsu in Kawaguchiko from where we had an amazing view of Mount Fuji, and the outdoor onsen of Kanbayashi Hotel Senjukaku in Kanbayashi Onsen, near the Snow Monkey Park, where we had our hot bath under the snow! These are 2 of the most amazing experiences of our lives. Click on the links to see some photos! That said, I know from personal experience that the first bath at an onsen can be quite intimidating, especially if you do not know what to expect. Japanese people are very kind, but there are some rules that need to be followed when entering an onsen. 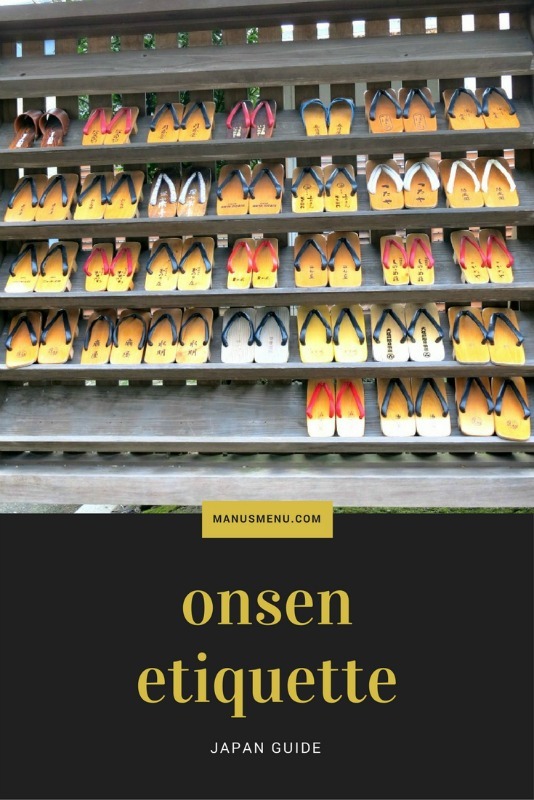 I promise you that after reading this simple guide, you will feel confident enough to experience the magic of onsen. And let me tell you one thing: after the first awkward moment, you will wonder why on earth we don’t have onsens all over the world! Take off all your clothes in the changing room and put them into a basket together with your bath towel. 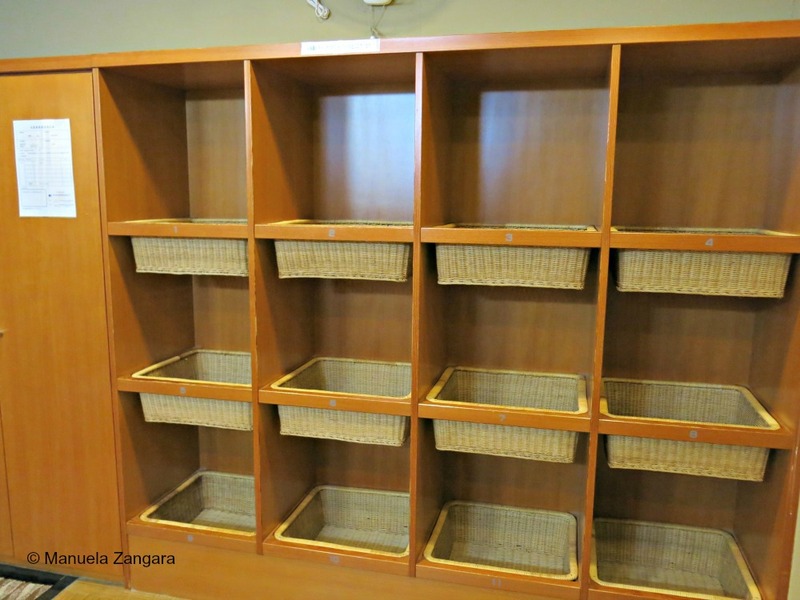 Coin lockers for valuables are often available. As I wrote above, Japanese hot springs are enjoyed naked. However, it is custom to bring a small towel into the bathing area, with which you can enhance your privacy while outside the water. This towel – that you will find in your room or at the public bath reception – must, however, be kept out of the water once you enter the bath. People usually keep it on their heads to prevent overheating. Before entering the bath, rinse your body with water from one of the taps just outside the big tub using a washbowl provided in the bathing area. Many places provide soap, shampoo, and conditioner! Make sure to wash while sitting on the little stool provided so that you don’t splash water around and inconvenience other people. Enter the bath and soak for a while. Note that the bath water can be very hot (between 40C to 44C – 104F to 111F degrees). If it feels too hot, try to enter very slowly and move as little as possible. After soaking for a while, get out of the bath and re-wash your body with soap at a water tap, while sitting on a stool. Make sure that no soap gets into the bath water. Tidy up your space after you finished cleaning your body. After you finished soaking, do not rinse your body with tap water, if you wish the hot spring water’s minerals to have full effect on your body. Dry yourself off a bit with your little towel before leaving the bathing area and entering the changing room where you will find the big towels. 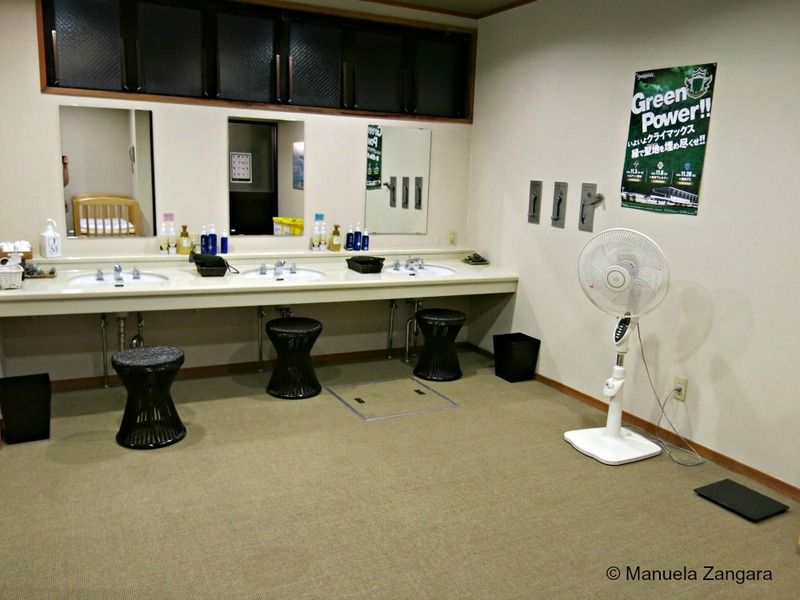 In the changing room of a ryokan, you will find everything you need after a bath: moisturizing cream, plastic hair brushes/combs, hair dryers, cotton buds… and even cold water. Remember to drink lots of water to rehydrate! Tattoos are strictly forbidden in onsen. The reason is that in Japan tattoos are associated with the Yakuza, the Japanese mafia. 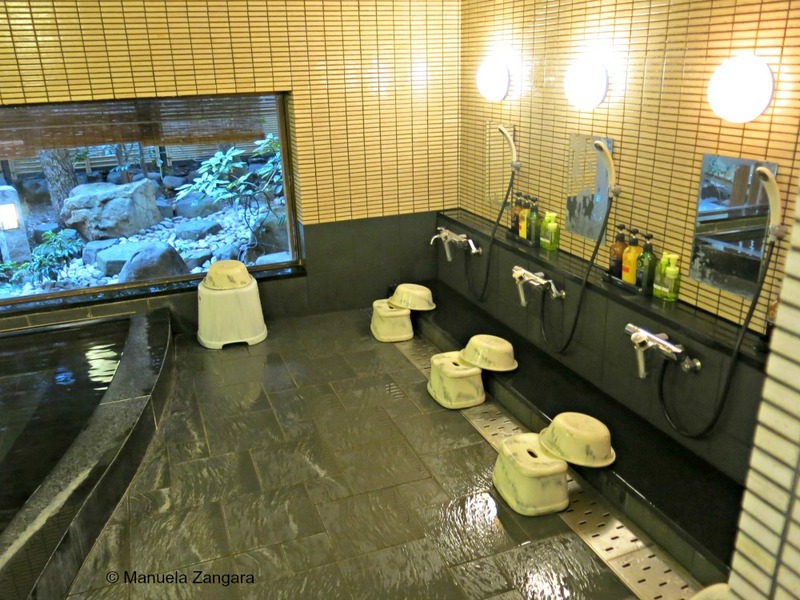 If you have a one, your best bet is to stay at a ryokan with a family bath. The water is HOT, so it may not be suitable for children. My 9-year-old daughter doesn’t like hot water, so she just sat down and dipped her feet. My 7-year-old daughter went in deeper. It all depends on your child. Just be careful. For obvious reasons, you cannot take photos inside a shared onsen! 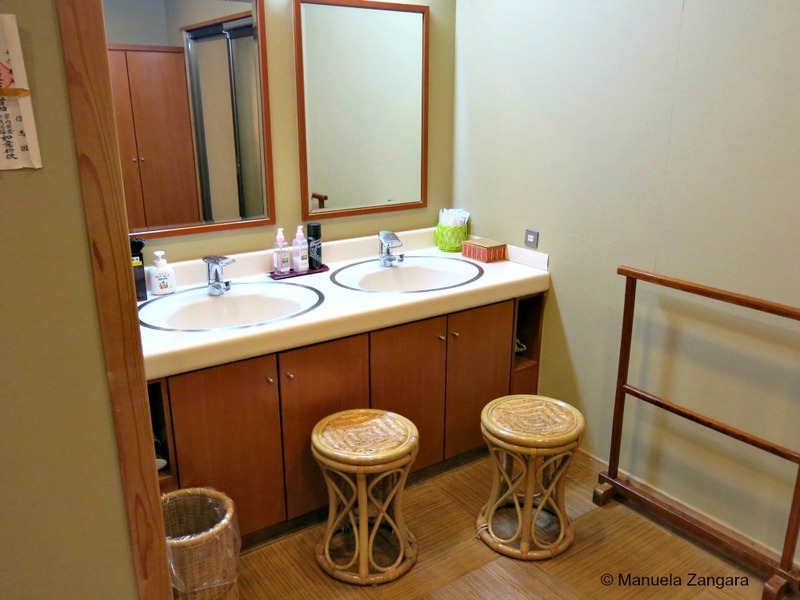 All the photos above were taken in family onsens, that is why the tub and changing areas are so small. But tell me, have you ever been to a Japanese onsen? Would you have a problem bathing naked with strangers? Please leave a comment in the comment area below!